Mega in size, comfort, and warmth for those who value both comfort and pack-ability. Designed specifically for comfort-oriented backpacking, bike touring or multi-day paddling trips. Expedition Equipment's 3-D construction creates a broad edge-to-edge sleeping surface and the combination of stretch top fabric and bed-like thickness make for a super-plush and comfortable night's sleep. Mega in size, comfort, and warmth for those who value both comfort and pack-ability. Designed specifically for comfort-oriented backpacking, bike touring or multi-day paddling trips. Expedition Equipment &apos;s 3-D construction creates a broad edge-to-edge sleeping surface and the combination of stretch top fabric and bed-like thickness make for a super-plush and comfortable night&apos;s sleep. 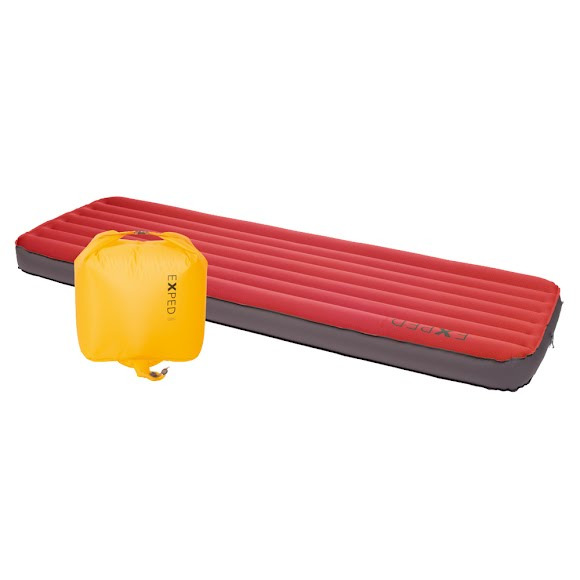 The included extra-large, 80 L capacity Schnozzel Pumpbag UL L makes for rapid inflation of this giant mat and doubles as a waterproof packsack for a sleeping bag or clothes. Rolled Size 10.6" x 7.1"